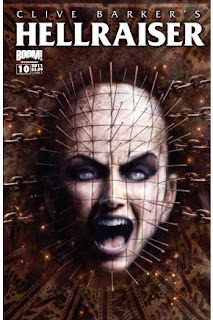 The Fellowship was fortunate enough to obtain a copy of HELLRAISER #10 from BOOM Studios. Clive Barker writes with Robb Humphreys and Mark Miller, Stephen Thompson and Janusz Ordon pencil, Space Goat Productions colors, and Travis Lanham letters. This issue contains two storylines, one with some exposition from the new Pinhead, and the other shows us the problems being faced by her predecessor. The new Pinhead has brought a friend to Hell, presumably to help her with a problem. The ‘retired’ guy, however, is having problems with his memory loss. I see some good storytelling potential here. We get enough sense of character from the new Pinhead to really open up the gates. And the idea of there being a surviving former Pinhead is just really cool in my opinion; how can someone return to a ‘normal’ life after seeing and doing what he has? The art works very well, too. It’s detailed enough to show emotion, and the representation of gore is clear enough to be gruesome. Overall I like this book. I’m a fan of the psychological stuff, and there’s great potential for some excitement and pain here. HELLRAISER #10 is available now at your FLCS or by order from boom-studios.com.